Hands-on demonstrations with Pioneer NEX systems running CarPlay were provided to Macworld, CNBC, and Digital Trends this week, as the head unit maker builds hype for its forthcoming software update. In a new and sooner-than-expected release schedule, the company revealed that CarPlay support will come to its NEX lineup in "a few weeks." Support will be coming to existing NEX infotainment systems from Pioneer in the form of a software update. Apple already launched CarPlay support in the iPhone with iOS 7.1, but head units compatible with CarPlay have yet to hit the market. 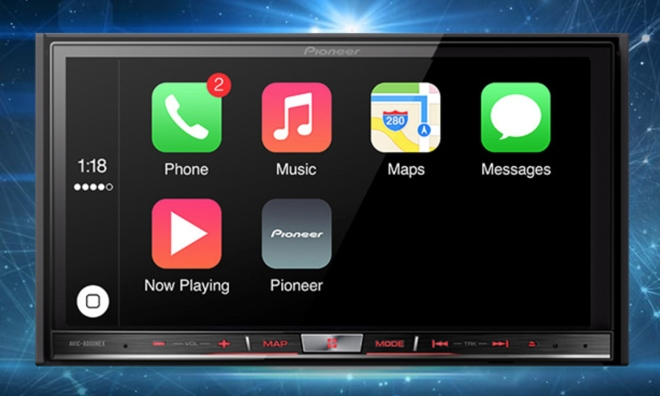 With this week's demonstrations and news of an impending launch, Pioneer appears poised to become the first on the market to offer CarPlay support. Apple's native apps for Phone, Music, Maps, and Messages will all sport out-of-the-box compatibility via CarPlay. Apple has also added a "Now Playing" application for content, while users will be able to get back to the NEX system's main menu with a Pioneer-created app button. CarPlay also boasts Siri support, allowing users to dictate text messages, get directions, have information read to them, or initiate a phone call with Apple's voice-driven personal assistant. Hands-on impressions with CarPlay were generally positive, citing ease of use, safety and quality. In particular, MacWorld highlighted the responsiveness of the high-end AVH-8000NEX model's capacitive touchscreen, which is a rare feature in an in-car dash setup. Once the update becomes available, users will be able to download a firmware file from Pioneer's website and transfer it to a USB drive. From there, it can be plugged into the unit and the update can be installed. Pioneer announced its first aftermarket CarPlay systems last month, with the NEX lineup starting at $700 for the entry-level AVH-4000NEX. Cheaper options are scheduled to arrive later in the year from Alpine, which has said its CarPlay compatible units will be priced between $500 and $700. CarPlay was officially announced by Apple at the Geneva Motor Show in April as a rebranding of the "iOS in the Car" functionality unveiled by the company at last year's Worldwide Developers Conference. In addition to aftermarket units, CarPlay support will be built in to new select 2014 vehicles from Volvo, Honda, Mercedes-Benz, Jaguar, Hyundai, and Ferrari. Future partners include Ford, Chevrolet, BMW, Kia, Toyota, Nissan, and Mitsubishi.